All is one. Change my view. I am curious as to whether or not there are any convincing arguments against this view? Not necessarily just that the Buddha said that oneness is an extreme that he did not teach, I already know that, I am wondering if there are any actual arguments that directly refute the idea of "oneness", either from the canon or from anywhere else? Re: All is one. Change my view. "Finally, in the domain of wisdom the Ariyan Dhamma and the non-dual systems once again move in contrary directions. In the non-dual systems the task of wisdom is to break through the diversified appearances (or the appearance of diversity) in order to discover the unifying reality that underlies them. Concrete phenomena, in their distinctions and their plurality, are mere appearance, while true reality is the One: either a substantial Absolute (the Atman, Brahman, the Godhead, etc. ), or a metaphysical zero (Sunyata, the Void Nature of Mind, etc.). For such systems, liberation comes with the arrival at the fundamental unity in which opposites merge and distinctions evaporate like dew. In the Ariyan Dhamma wisdom aims at seeing and knowing things as they really are (yathabhutananadassana). Hence, to know things as they are, wisdom must respect phenomena in their precise particularity. Wisdom leaves diversity and plurality untouched. It instead seeks to uncover the characteristics of phenomena, to gain insight into their qualities and structures. It moves, not in the direction of an all-embracing identification with the All, but toward disengagement and detachment, release from the All." 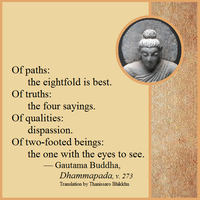 ---"Dhamma and Non-duality", Bikkhu Bodhi. Last edited by paul on Sun Apr 15, 2018 5:15 am, edited 1 time in total. SN 12.48 is adequate to answer your question from the Dhammic point of view. If you wish to know something ontological or cosmological beyond that, such conjecture is not connected to dukkha & nirodha, and thus to the Dhamma. Not necessarily just that the Buddha said that oneness is an extreme that he did not teach, I already know that I am wondering if there are any actual arguments that directly refute the idea of "oneness", either from the canon or from anywhere else? This called Mana in Buddhism. That is any form of measuring. The thought higher, lower and equal are all come under Mana. All is one is the thought all is equal. By the way, if you have come so far you are an enlightened being but not necessarily an Ariya. [The Buddha:] "Yes, Ananda, you heard that correctly, learned it correctly, attended to it correctly, remembered it correctly. Now, as well as before, I remain fully in a dwelling of emptiness. Just as this palace of Migara's mother is empty of elephants, cattle, & mares, empty of gold & silver, empty of assemblies of women & men, and there is only this non-emptiness — the singleness based on the community of monks; even so, Ananda, a monk — not attending to the perception of village, not attending to the perception of human being — attends to the singleness based on the perception of wilderness. His mind takes pleasure, finds satisfaction, settles, & indulges in its perception of wilderness. "He discerns that 'Whatever disturbances that would exist based on the perception of village are not present. Whatever disturbances that would exist based on the perception of human being are not present. There is only this modicum of disturbance: the singleness based on the perception of wilderness.' He discerns that 'This mode of perception is empty of the perception of village. This mode of perception is empty of the perception of human being. There is only this non-emptiness: the singleness based on the perception of wilderness.' Thus he regards it as empty of whatever is not there. Whatever remains, he discerns as present: 'There is this.' And so this, his entry into emptiness, accords with actuality, is undistorted in meaning, & pure. Go to the toilet, do a nr. 2, and then look at it, smell it, *gasp* touch it, and think "This, too, is me. All is one." Even more radically: if you are capable of doing a "number 2", then all can't be just one, can it? The One is manifold, versatile, in flux. If it's manifold, then it ain't one. Achintya-Bheda-Abheda (अचिन्त्यभेदाभेद, acintyabhedābheda in IAST) is a school of Vedanta representing the philosophy of inconceivable one-ness and difference. Inconceivable being the key term here. Anyway, the best objection against the idea that "All is one" is that "All is one" has no explanatory power, it's useless. However, it seems that someone who already subscribes to "All is one" (like the OP, asking that we change their view) cannot move out of or away from it, because it frames all of their efforts and keeps them within "All is one". In that sense, "All is one" is a metaphysical straitjacket. I'm of the opinion that the doctrine is eminently conceivable, in that one can say the words. It's the fact, the one-ness itself, which is inconceivable. Agreed, but I'd call that the "second best objection". The best objection is that it doesn't lead to the end of suffering. I don't think that ideas are so important or compelling that they can be a trap. It seems to me to be more of a cul-de-sac or dead end, rather than a straitjacket. Mountaineering, falling in love, or meditation are all sovereign remedies. It's the fact, the one-ness itself, which is inconceivable. But how then can they write whole tomes about it? Papanca. Or, I might have comletely misunderstood it. Yes, I have exactly the same feeling. I also suspect there are many different "All is one" mentalities, and the form of words alone is the same.